The thing about me is that I´m constantly changing. I cant help it really. It´s not my fault, I promise. (<-- lol... why did i just laugh??) Some people say I have some sort of bi-polar problem, some people say im schitzo... I dont believe it. I just think I´m simply... a blank canvas. I can mould myself into whatever I want to be. 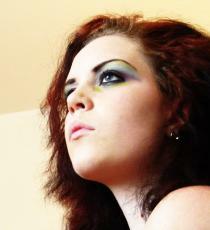 I´m a drama queen, and quite bluntly honest about it. Because I hate drama queens. I always blow things, scenarios, and people´s reactions wayyy out of proportion in my mind. I used to have a severe inferiority complex. No one can tell now, much less believe me when I say it. In some morbid way, I miss the days when I would slunk around the people I saw as so much better than me, giving them a wide berth so as not to soil the holy ground they tred upon. I love drinking, as a social action, more than sitting on my own. Tho I do have my alone moments too. Those come rarely, when I feel the need to be happy just "being". I am unfixably adicted to the internet, because most of my life I´ve spent alone. For the last 8 years (since I was 12) whenever I was asked what I´d do for fun, my answer would be "well there´s this computer..." And when asked if i had any friends, i would reply "well, there´s this computer..."
I know farrrrr too many people, but have very few real friends. Leave me with some good friends and we´ll be runing around the streets like maniacs at 2 in the morning, jumping in fountains, laying in the middle of the highway, smoking out ant colonies, and searching the house for small change so we can buy candy and tequila. We tend to have more fun than anyone else on earth... just dont find us when we´re alone. Because we´re probably sitting on a roof somewhere, writing depressive poetry about death the torment of our souls. Apparently I have a god complex. How cool is that? Aaaaaannnd I´ve just run out of things to say... which might be a good thing. This has gotten too long as is.